During the golden age of Sega in the ‘90s, there was something about their games that just grabbed you. These games didn’t need time to grow on you, they hit with full-force impact, whether you were sitting down in a Daytona USA arcade cabinet, firing rounds in Virtua Cop or super-speeding through levels in Sonic 2. The original Yakuza released in 2005, four years after the demise of Sega’s final home console, the Dreamcast, but that same Sega spirit still burns inside of it. Although the game is rightly seen as the developer continuing to broaden its horizons in the vein of its influential open world opus Shenmue, it’s the immediacy of Yakuza’s fist fights where that glimmer of classic Sega lies. These over-the-top street brawls crackle with the same intensity as the first time you fired up Streets of Rage or knocked your opponent out of the ring with a flying knee in Virtua Fighter. It’s that perfect feedback as you land every blow, and it’s knowing that, above all, the developers wanted this game to be fun to play. Sure, they wanted to tell a good, oftentimes serious story about a conflicted yakuza, but not if that meant you couldn’t seque from a somber cutscene to a 10-person melee where one of the participants is swinging around a 10-foot couch like a baseball bat. Yakuza Kiwami (“Extreme”) lets gamers experience the wacky fun of the original Yakuza in a remake with modern graphics and gameplay polish. 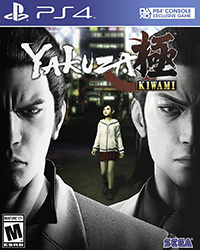 And even though the Yakuza series has spawned five sequels (not including spinoffs), there’s no history to brush up on here, because the saga of Kazuma Kiryu is just beginning, so you can sit back and enjoy the ride from the beginning while enjoying modern conveniences like bright HD visuals and consoles that are already hooked up to your TV. For all its modern sheen, though, this is still the original game from 2005, for better or worse. It’s worse if you’re looking for the dozens upon dozens of hours of story and side mission content offered by the more recent Yakuza games. For me, Yakuza Kiwami’s relative brevity is a positive, since it moves along at a brisk pace and doesn’t let characters or scenarios overstay their welcome. For gamers interested in the history of the medium, it’s an intriguing look back at gaming in the mid-2000s, when character-driven stories of this level of quality were hardly as common as they are today. More than anything, it’s a lot of fun, whether you’re fighting, getting to know the interesting characters or exploring the bustling streets of Kamurocho which, because of the game’s unfailing sense of humor, can seem lively and welcoming one moment and in the next moment, like a scene out of Death Wish 3. Cheers to Sega for never letting realism stand in the way of a good time.